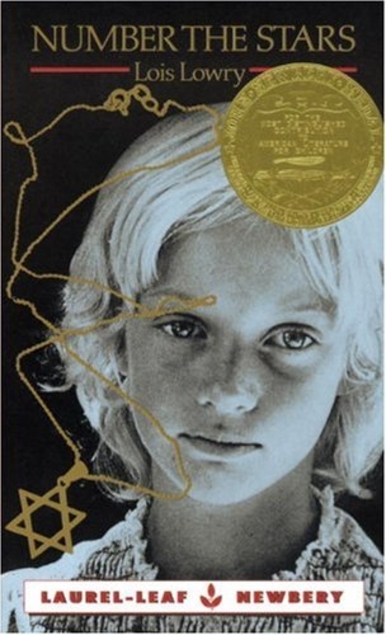 I decided to begin my Newbery Medal Challenge with a favorite author and a book I probably should have read years ago: Number the Stars by Lois Lowry. This is one of those books I seem to have seen around for years–the cover feels extremely familiar–and it probably came up in oral book reports in elementary school. But somehow I never read it, or even knew much about it. The story turns out to be set in Copenhagen during World War II. It follows 10-year-old Annemarie Johansen, whose family helps their friends the Rosens, including Annemarie’s best friend Ellen, to escape from Denmark when the occupying German soldiers begin rounding up the Jews. I think I may have avoided this book because I had a vague idea it was sad. Maybe I coupled it in my mind with The Diary of Anne Frank? Well, if it’s not too much of a spoiler to say so, I was glad to find that this has a happier ending than Anne’s story. Which is not to say there weren’t tense moments along the way! There are, plenty, and the German soldiers are threatening and imposing, even without resorting to any atrocities Lowry could have included–in fact, there’s almost no violence (it is a kids book) but that doesn’t reduce the sense of danger any. This is in some ways a very focused book, revolving around one incident and spanning, primarily, only a few days. Somehow Lowry manages to show a broader picture though, of life in Copenhagen during the Nazi occupation. She shows the deprivation, while also giving a beautiful picture of Denmark and the Danes. The story centers around the historical rescue of the Danish Jews–the Danish resistance movement helped the vast majority escape to Sweden, and some 99% of Danish Jews survived the Holocaust. It’s inspiring, and there’s also a lot that’s simply charming–especially King Christian of Denmark who rode his horse through Copenhagen daily, alone and unaccompanied, to see his citizens. I cannot imagine a country leader doing that today!! Annemarie and her family are representative of the Danes in general, while being individuals and very likable, with their own history woven through World War II and earlier time. Lowry’s Afterword is especially moving, as she writes about the personal inspirations she found which led to her writing the story. Overall, a satisfying story with a fascinating glimpse into a slice of history that, despite knowing a lot about World War II, I hadn’t known much about.